Frannie - Available for Adoption! 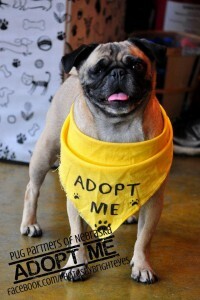 Frannie is a 2 yr old pug who is very playful. She loves to play tug of war with her human during the day and ready to snuggle up on the couch at night. She is house broke, walks great on a leash, crate trained and knows a few tricks. She only has one eye but she doesn’t let that stop her. She came to us with some urinary troubles but has that under control with good food and a cranberry supplement. Don’t let that discourage you from meeting Frannie as her supplement is fairly inexpensive. Frannie would prefer to be in a home with other boy dogs as she wants to be the only queen getting spoiled. She does great with kids of all ages and doesn’t mind cats either.